It’s not easy taming a Demon Beast that wants to run wild with 840 horses at its disposal while discharging record-breaking metrics which would leave the brightest of mathematicians dumbfounded. Let’s take for example the 2.3-second 0 to 60 mph time that seems more akin to runway jets than muscle cars. Or maybe the NHRA-certified quarter mile explosion of 9.65 seconds and 140 mph! Another momentous accomplishment is the entitlement of generating the highest g-force acceleration (1.8 g) by a production vehicle. Well, the 2018 Dodge Challenger SRT Demon is perfectly legal and ready to showcase its self-assurance to racing fanatics while manifesting a new muscle car era. To witness Dodge and SRT’s new performance prodigy in action Automotive Rhythms was invited to Atco Raceway in South Jersey for drag runs, burnouts, and street drives around the vicinity. The popular drag strip features a ¼-mile track for enthusiasts and hosts a plethora of routine car shows and meets. Also on deck was the 2018 Dodge Durango SRT and 707-horsepower 2018 Dodge Challenger SRT Hellcat which set the tone for the company’s “next generation” muscle car blueprint. With Dodge performance car sales continuously rising the brand had to stretch the perception past the typical imagination by releasing a bevy of diverse and on-demand vehicles that can run with the best of them. Expect a limited production run of 3,000 units in the United States for the Demon phenom. Every element the Demon possesses was designed and engineered purposely by artisans focused on weight reduction, track durability, and heat dissipation. The platform begins with the supercharged 6.2-liter HEMI Demon V8 (codenamed Benny) with 808 initial horsepower and 717 lb-ft of torque. The engine is paired with a TorqueFlite 8-speed automatic transmission with paddle shifters that are instrumental for setting up drag runs. High-Octane Mode will unleash the 840-horsepower and 770 lb-ft of torque which was absolutely amazing out there on the strip. In the beginning there is a high learning curve for comprehending the operational controls and systems to unearth the vehicle’s power and interpret its antics such as running 9s and lifting the front end during takeoff. Before my first drag run I took the Demon on a drive through rustic, jovial neighborhoods to become acquainted with its beastly ways. To my surprise it was quite docile and behaved like a saint. The steering on the Alcantara suede, flat-bottom wheel was light and fluid, Uconnect infotainment continues to impress with its app focused simplicity, and the Harmon Kardon audio system is a delight when you’re not rocking out to the notes of the supercharger. However, the Challenger’s interior still incorporates too much hard plastic for my taste. I did light it up once just to see what type of reverb the engine and exhaust produced through the quiet streets. Thankfully Atco Raceway was around the corner because in ordinary circumstances it would take a lot of restraint to divert attention away from local authorities. Either or an 840-horsepower muscle car on the road is pretty spectacular, especially visually! • Fire up the Demon and tap the SRT button (twice) on the center stack which will bring up Drag Mode. You will graphically see all of your selections on the Uconnect 8.4” touch display. • Next is to select the High Octane button — also on the center stack — which increases power to the full 840-hp. • On the display you then choose Drag Options at the bottom of the screen to bring up an image of the Demon highlighting the Line Lock in green. • Now you use your left foot to apply heavy brake pressure and simultaneously select Activate Line Lock Control on the screen. • Next is to push and hold the “ok” button on the left of the steering wheel. This action brakes the front wheels so you can spin the rear, reconfigured Nitto tires. At the same time you lift your foot from the brake pedal, smoothly rev the accelerator between 4,000 – 5,000 rpm for a just a few seconds, and as you are into the burnout release the “ok” while continuing on the gas. • To engage the TransBrake you pull both paddle shifters back with your left foot on the brake. • Then lightly give the Demon gas until about 1,700 rpm and hold it there. Let go of the left paddle and then release the brake. The vehicle is still stationary at this point. • When you are ready for flight let go of the right paddle and give the Demon steady throttle before hitting it hard up the strip. • Come back and repeat until the process becomes familiar without instruction. By selecting the Performance Pages icon the Demon will showcase vehicle parameters on the screen including Gauges, G-Force, Engine, Dyno, Oil Pressure, and a 0 to 60 Timer. I’ve driven a bevy of performance cars on and off the track including a Bugatti Veyron and the Demon stays true to its name. 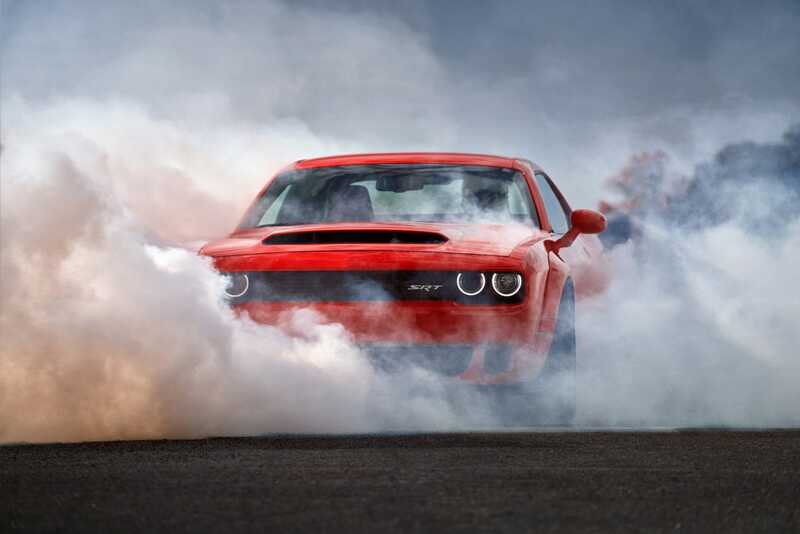 In this case ignorance is not bliss and the very reason why owners of a new 2018 Dodge Challenger SRT Demon receive a complimentary, full-day session at Bob Bondurant School of High-performance Driving in Chandler, Arizona. Of course acceleration is the number one priority when drag racing so Dodge and SRT analyzed every nut and bolt for Demon optimization since there are operative distinctions between it and a Hellcat Widebody. 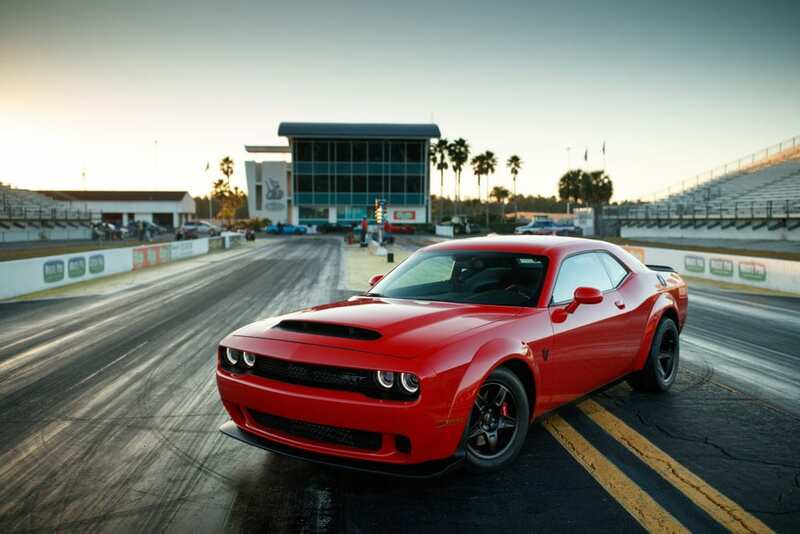 For example, the Demon uses smaller, high-performance Brembos and lighter, hollow sway bars opposed to the heavy-duty Hellcat bars needed for high-speed turning. Our test vehicles were devoid of rear seats for weight savings and included the $1 Demon Crate upgrade package for top drag performance. Some of the componentry included front skinny tires, replacement instrument panel switch module, Conical performance air filter, and two valve stems. 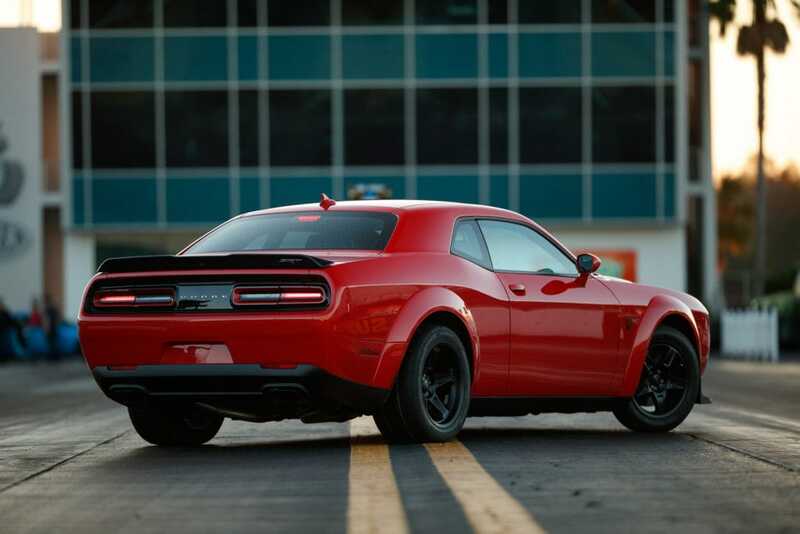 Other significant changes included compound and construction modifications of the drag radial tires for better grip and faster speeds, raised RPMs from 6,200 to 6,500, an added After-Run Cooler for chilling the vehicle in-between runs, SRT Power Chiller liquid-to-air intercooler chiller system, and the SRT Demon-tuned three-mode (Street-Sport-Drag) adaptive damping suspension whereas Drag Mode distributes the Demon’s weight towards the backend. MSRP is $84,995 and includes a $1,700 gas-guzzler tax but does not include a $1,095 destination fee. The 2018 Dodge Challenger SRT Demon is not only a prized possession but will soon become a treasured muscle car collector’s item.